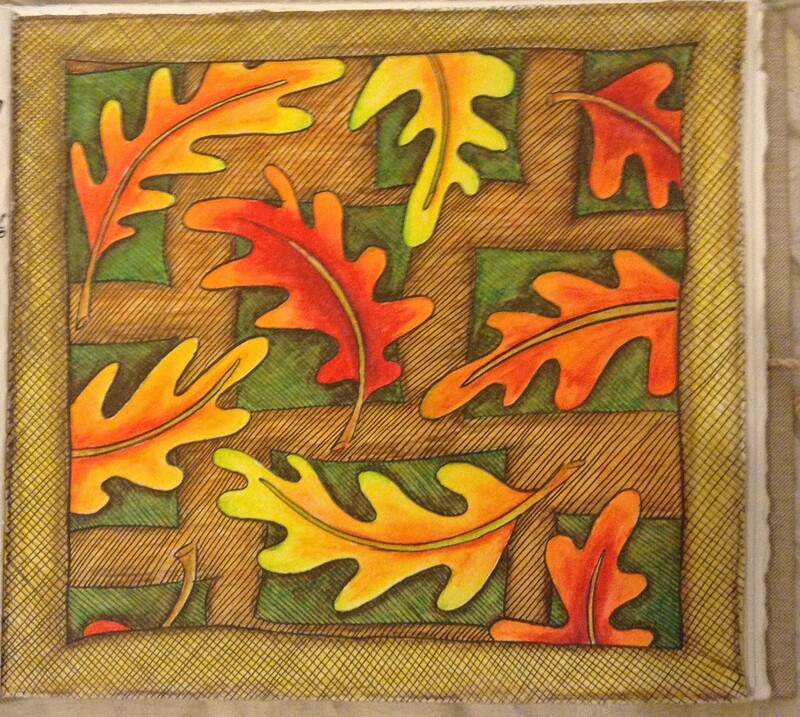 This entry was posted in 2014 Artwork, Journal and tagged art, autumn, colored pencil, coloured pencil, coloured pencils, drawing, drawings, fall, journal, oak, pattern, seasons of colour, watercolour pencils. Bookmark the permalink. The contained kind of brick-shapes behind the leaves suggest shelter. As if, now the weather is getting cold, you are looking for a wall to hide behind to keep warm. Those regular shapes make a nice contrast with the free-falling leaves. Personally I LOVE autumn and winter. Sick to death of blue skies and sunshine. Also – LET IT RAIN!!!!!!!!! I also love autumn Julie, I usually enjoy winter, but it has been a bit bleak and it takes me awhile to adjust, soon I will embrace rugging up, and snuggling down. I do enjoy the different seasons, I lived in Cairns for awhile and did not like the weather there at all, I really missed the changing seasons and colours. I love fall, but happy to be in the northern hemisphere and experiencing spring. Rain continues to be part of our weather menu at the moment too. Wonderful colors and whimsical oak leaves! May your Autumn continue to be beautiful. Let the rains keep falling on your home! This is very cheery for a gloomy autumn day! You are lucky to have such a wonderful deciduous tree – its something I miss very much from the Northern hemisphere. I especially like the journal spread, the balance of text and image works very well. It has suddenly got cold here in Sydney too, I feel as though we have skipped over what little autumn we do have. But I do love getting into winter clothes! I know what you mean, I have just finished changing the wardrobe over to winter clothes, lots of new things to wear. I lived in the tropics for awhile and really missed the changing of the seasons, and the changing of the wardrobe. Karen.